At five o’clock in the morning, the Robins sit on the peak of the neighbor’s house facing the east, singing their morning song. Sometimes each house has a Robin heralding the dawn. Sometimes it is only one bird for the whole cul-de-sac. At times the House Finches take the place of, or join the Robins. For the past three decades I have been out running or walking early in the morning, often before the sun rises. I had never noticed the consistency of the placement of birds on the peaks of rooftops of houses until recently. It seems that their singing facing the direction of East is particular to the spring and early summer months. Often I take time to listen deeply, and encourage others I am working with to do so as well throughout the day – to listen deeply to our bodies, our breathing, our hearts, our intuition, as well as to the clouds, animals and birds, the plants and trees, all sentient beings. And at times I engage in dialogue with those around me. Although, I have talked with birds and animals since I was a young child, this spring and summer as I have been slowed down by circumstances outside of my control, and am re-learning how to breathe, to listen anew to the natural rhythms of my energy as well as the voices of nature. One morning, Great Blue Heron was enthroned on the center of the peak of the neighbor’s house, and I asked it was it was doing. It lifted, expansive wings stretched out over my head, and flew to the South. No kraakk, the wrenching sound herons make when they are disturbed, simply the magnificence of blue-grey and silver feathers in air, feathers in air, repeated again and again. Another dawn, 12 Crows mobbed a Red-tailed hawk in a nearby Douglas Fir, and the Scrub Jays flew back and forth with the morning news. Awhile later, an American Kestrel landed above the mail box and watched while we walked past. This morning Anna’s Hummingbirds flutter in front of me, whisking back and forth past the feeder, small jika jika jika chirps, pausing; iridescent red crown and throat contrasted with green wing feathers in the sweet morning light above me. Soon we will head to the coast, to an estuary named Willapa Bay, where hundreds of birds follow the water’s ebb and flow, and bring music of the tidewaters. May you have time this season to listen to the birds…. descant along the tidal shifts. Gwendolyn Morgan learned the names of birds and plants from her grandmothers. She holds an MFA in Creative Writing from Goddard College, and a MDiv from San Francisco Theological Seminary, where she studied with Patricia and Kip many moons ago. She has been a recipient of writing residencies at Artsmith, Caldera and Soapstone and has poetry published in: Calyx, Kalliope, Manzanita Quarterly, Tributaries: a journal of nature writing, as well as other literary journals. She currently serves as the manager of interfaith Spiritual Care at Legacy Salmon Creek Medical Center. Gwen and Judy, her partner, share their Salmon Creek home with Abbey Skye, a rescued Pembroke Welsh Corgi. 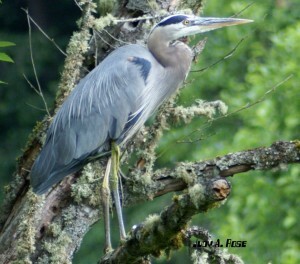 A friend of mine reported to me last week over lunch that while recently jogging in the Pennsylvania bush along the upper Delaware River he nearly collided with a giant blue heron that stepped suddenly from the bush — head high — into his arms. Freaked him out to be conking heads with the tall bird of your imaginal, winged words. I had the pleasure recently to visit the dunes of North Beach on the Point Reyes seashore in northern California. That beach fronts the Pacific in a boisterous tussle of sandy foam and fierce undertows. Only seabirds take to the water there. Because of the stiff, mid-summer onshore breeze I decided to explore a little and found a spot just behind the dune ridge to lie down on my blanket and drift for a while without the burden of my inability to release passing time from my grasp. Ensconsed there in a roomy sand bowl, encircled by tenacious succulents, I remembered twenty years ago when we all passed along those dunes and traipsed to our futures. From my reclining reverie, objects suddenly flashed low overhead. Startled, I sat up, then stood up, and watched eight pelicans surfing the dune ridge down the beach. The ridge was deflecting the onshore breeze upwards along it’s length. The pelicans sensed this gifted updraft and , turning slightly into the breeze, traveled atop the ridge without a single flap of wing, gliding slantwise home in the late afternoon. I lay back down for a while, and then another five pelicans flew overhead in the same flapless manner. In order to complete the inverse Fibonacci series, the next group would need to contain three pelicans, and it did. Then came the group of two. Watching these ten pound birds with six-foot wingspans effortlessly glide by had me thinking rather quickly: “I’m trying to hard to make things happen.” I remembered those Hiphil verb tenses we studied whose meaning is “to cause or make” things happen. And all along I thought it was I who was making things happen. Now approaching the half century mark of age, I realized it is mostly events that have made me happen. There is something both comforting and disquieting about veils shrouding our plans for life. Walking alone the mile back to the parking lot, I see the designated last, single Pelican which complete the inverse Fibonacci series. This one is not aloft the dune ridge, but skimming the flat deep water behind the six-foot breakers. I watch it travel northward until it disappears into the mist. Only when it vanishes do I feel fully free of some burden I cannot find words to express. You are painter and a poet. And I am your reader.